I remember when I first heard of this epic was waaayyy back in﻿ college, freshly enamored and deeply affected by Anne Rice's fifth Vampire Chronicle, Memnoch the Devil. 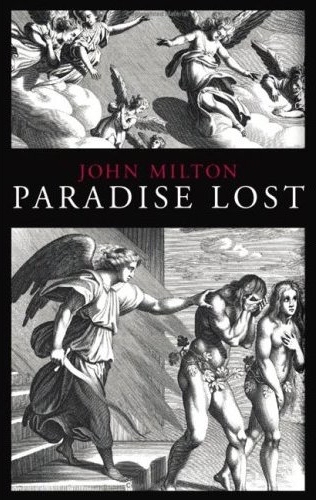 I was so hung up with Rice's book and how much it provoked me when my friend told me that I should give John Milton's Paradise Lost a try. Let me tell you, it was a HUGE undertaking given that this was written in verse... in archaic English... no longer used (except maybe in the British Parliament) which makes those dialogues in historical novels paltry in comparison. The footnotes were helpful but distracting and suffice to say that it took me over a year to finish it. My grey matter was oozing out of my ears and bleeding through my nose by the time that I was done with it. But I was proud of finishing the book, I consider it one of the crown jewels in my reading history. It's no wonder that this work of art has transcended the Fiction shelves and is now considered not only a classic but a good reference material for Fallen Angels the same way that Dante Alighieri's La Divina Comedia is synonymous with Heaven and Hell. Paradise Lost has two stories of The Fall: Lucifer and his cohorts Fall and Adam and Eve's expulsion from the Garden of Eden, falling from the graces of God. It is told on flashback and flash-forward style. But since that is too detailed, can be long and extremely confusing, I'll relate the story in chronological order in a very concise manner. The Holy Trinity. God the Father though omniscient lets things play out on their own. In heaven he is surrounded by Angels, pure spirits who are also God's messengers. Father God one day announced that God the Son and he will have equal status. This doesn't sit well with all the angels especially with Lucifer. They then rebel and were cast out of Heaven and Lucifer became Satan, the Prince of Hell. The war in Heaven went on for three days and Satan was defeated by God the Son and drove them to the fiery pits of Hell which Father God conveniently made for them out of Chaos. Father and Son then creates the World and made Man who was made in their likeness. But like the angels, Adam and Eve were given the gift of free will. Together man and woman lived in bliss, acting as stewards to God's other creations with frequent visits from their heavenly siblings. They are free to do what they want except touch the Tree of Knowledge and the Tree of Life. Things in Hell are not doing well either because Satan is still smarting from his defeat and want revenge and he wants it served cold. So the biblical temptation happens and Adam and Eve were thrown out and were cursed to work and endure childbirth pains respectively. Though they have been punished severely for their weakness they are comforted that through their line, the Son will be made flesh and with this, their descendants will be redeemed. This summary doesn't do the epic poem any justice. The opening itself will capture not only your imagination but your attention as well. Milton was somewhat fair in portraying all the characters. His Satan is pure of malice, hate and revenge in his heart but at the same time he's nothing but a willful and jealous child who refuses to see reason, these characteristics make him compelling and seductive. This story explains why Satan is who he is, a great manipulator and very cunning, his tongue is his greatest gift. Like a good dictator, he's a good orator, he can command his army to do anything, drop, roll, play dead, anything. The flashbacks and fast forwards will also keep you spiraling down or up as Milton gives us the backstory. The speeches of the characters as they sway their audiences will surely convince you to argue and fight for their cause and maybe even question your own beliefs at some point. In another video, the photographer, along with his wife Manisha D Ratnani can be seen enjoying the drill along with the couple and we must tell you that they all look simply adorable. "I volunteered to make torans for Nisha's Diwali school party. I thought it was one toran, but it turned out it needed to be 55 torans (lol). She was last seen Aug. 28, two days t shirt creator after her brother disappeared, the statement said.Escobar spent five years in prison for robbery starting in the mid 1990s, Hayes said. Records in Texas show Escobar has had arrests for vehicle burglary, trespassing, failure to stop, public intoxication and two assaults, t shirt creator most recently in November 2017.